When I was 6 years old, I began begging my folks for a bird. By the time I turned 8 years old, I had my first parakeet, Perky. Perky and I spent hours together each day – he taught me about handling and understanding birds (some days I was a better student than others) and he lived an exceptionally long and healthy life before he passed at 12 years old (apparently this is VERY old for a parakeet). While it has never gotten any easier saying goodbye, over the years I have had many avian companions, culminating in the subject of this very blog. 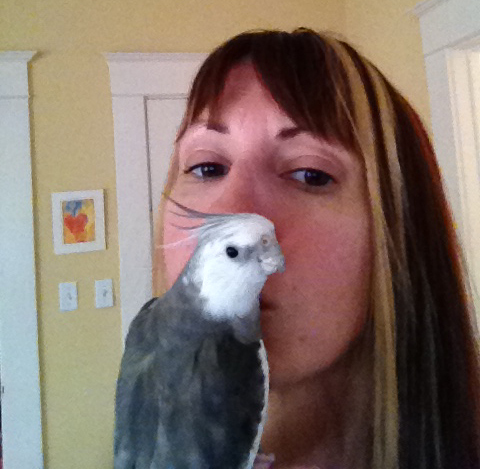 Me kissing my angel’s soft feathery tummy. One day last year I was in La Jolla, CA, on business and I wandered down to the beach to try to get a glimpse of the famous seals that liked to hang out on the rocks in the surf. But what struck me as soon as I arrived were all the BIRDS. Pelicans, cormorants, seagulls (my favorite sea bird)…..WOW. While I was there, I happened to meet a young lady who was couch surfing her way across the country on a break from her studies to become a cop. I (characteristically) was afraid to venture down the cliff side to the crashing surf where most of the birds were hanging out. She (characteristically, I suspect) was not. I had never much thought about it before then, but in the moment she said it I realized it was true. And most especially I love birds. But often over the years I have found that many others don’t really understand why I specifically love birds – they don’t seem to get how wonder-filled I am at even the most casual sight of one, wheeling effortlessly above me in the sky. I also often struggle to find stories, books or movies about birds which don’t feature gory bird stories or stomach-turning details about bird abuse or exploitation. I can’t read things like that, period. So imagine how delighted I was recently to discover a charmingly wonderful book called “The Wild Parrots of Telegraph Hill“. In an utterly spontaneous way, Mark became the first human to achieve a level of trust with the wild parrot band – so much so that they would often feed from his hand, and let him care for them when they became ill. After six years living side by side with the parrot band and becoming friendly with many individual parrots (without ever once trying to capture or tame any bird – and this is integral to the story!) Mark’s situation changed and he was inspired to write a book about his experiences. That book became “The Wild Parrots of Telegraph Hill”. Suffice it to say that I was RIVETED for all 277 pages, and totally bummed when it ended. This book is amazing. I could write a book ABOUT this book, but I will keep my thoughts to myself from here in hopes you will take my word for it and read the book (and watch the film) for yourself. But I will share one thing – probably my favorite realization from the whole book. It is this – every creature on the planet gets lonely sometimes. Every creature feels scared. Every creature fears death. And every creature longs for life – and others to share life with. We truly are not alone in this world. The wild parrots in action.